Rooibos Herbal Tea joins Stash in their pure ingredients quest. Though not as easily found, Rooibos Herbal Tea still has a 4.6 star rating on Amazon and their product looks top notch. What is the key behind this great tea and why do people love it so much? Rooibos Herbal Tea focuses on providing a great and beneficial tea, without the use of artificial additives. And even though Rooibos is not a rare tea, this brand makes sure their tea stands out from the rest. Their rooibos is actually sourced from South Africa and a lot of their inspiration comes from the area as well. So if you are going to get 100% natural rooibos tea, it is best to get it directly from the source. Rooibos Herbal Tea specializes in providing the best quality tea possible. For this reason, their Rooibos tea is organically grown in South Africa where the founders live as well. Not to mention that 100% organic rooibos is their only ingredient in their tea. No artificial additives, preservatives, or flavors. Just pure and simple Rooibos. Rooibos is a highly beneficial, but strong tea. It can relieve headaches, as well as prevent skin disorders, high blood pressure, premature aging, and overactive allergic responses in the body. Many people do not like Rooibos tea for its very strong taste, but others rather enjoy it. Herbal teas in general have a lot of great benefits to them. Regardless of the type of herbal tea you are drinking, there are somethings that you will be take advantage of. One benefit that you will get from all tea is weight loss. Now, this is not like the tea will burn off fat. Rather, the best herbal tea will remove water retention, so you will visibly look slimmer because you will lose a lot of your excess water weight. Another great thing about herbal tea is that you get a access to a wide variety of antioxidants, vitamins, minerals, and other nutrients. Because herbal tea often features a combination of herbs, you are able to take in a variety of great things that can be highly beneficial to your body. Other common health benefits of the best herbal tea include relaxing the body and mind, aiding in sleep disorders, reducing inflammation, easing various pains, protecting against common diseases like the cold or flu, boosting immune system, regulating the digestive system, and stimulating cognitive function. Rooibos Herbal Tea gives you 100% organic rooibos which has numerous benefits, including helping with headaches and even preventing premature aging. While no product is perfect, Rooibos Herbal Tea gets incredibly close. However, for the price, I would have liked to see more quantity. For over $10, you are only getting 40 tea bags. There are other brands that offer up to 120 tea bags for $10 more. However, seeing as this tea is sourced and shipped from South Africa, it makes a bit more sense. You are paying for 100% quality over quantity, which is definitely what you want to be doing. However, because it is a red tea, this is definitely not going to be everyone's cup of tea. Red tea is very strong and can be very bitter as well. While it is highly beneficial for you, it is hard to get used to, unless you enjoy bitter and strong teas. So just be wary of that. 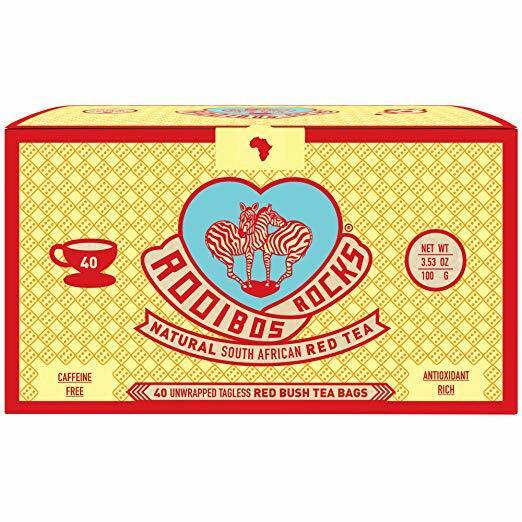 The founders of Rooibos Rocks discovered South Africa on their honeymoon and fell in love with it. Not long after, they decided to move down there from the UK and create a tea company. Their product line is not very expansive, but what they do have available is of the best quality and taste. Not to mention that every thing is 100% organically grown in South Africa. If you are looking for top quality, 100% organic tea, Rooibos Herbal Tea has got you covered. Rooibos is highly beneficial. It is mainly used to relieve headaches, but can tackle a number of issues including preventing high blood pressure, and overactive allergic responses. What's better than a great quality tea? Getting it straight from the source. Rooibos Herbal Tea is grown and shipped from South Africa. The taste of red tea is extremely strong and bitter, which not everyone may enjoy. Rooibos Herbal Tea offers the best quality tea possible with 100% organic and fresh ingredients. Actually, ingredient, since there is only Rooibos used here. This stuff will give you exactly what you want it to with its antioxidants and other various benefits. That is, however, if you can get past the taste of it. Red tea is extremely strong and bitter, and most people do not like it very much. But if you are one of those people who love strong and bitter teas, then look no further than Rooibos Herbal Tea. Overall, Rooibos Herbal Tea is a great brand that you will not regret buying from. Their ingredients are high quality and offer some great health benefits. If you want to try them out for yourself, you can grab a box for $12.50. For more information about the best herbal tea, check out the rest of Green and Growing. Here are some top questions that I found for people seriously considering buying the Rooibos Herbal Tea South African Red Bush. Do the tea bags have a dipping string attached? No, just the tea bags. Can this tea be brewed in a coffee maker? Absolutely!